IAN McCartney, the Labour Party chairman, was embroiled in a furious row last night after describing a Jewish member of the shadow cabinet as a "21st century Fagin". He caused outrage by comparing Oliver Letwin (right), the shadow chancellor, to the loathed villain in Charles Dickens's Oliver Twist, during a barnstorming speech meant to rally Scottish Labour MPs at their annual conference. "The real danger . . . is the Tories. What would life under Slasher Letwin look like? No Oliver Twist, this man, more of a Fagin. "This 21st century Fagin will pick the pockets of Scotland's pensioners by abolishing the pension credit and then plan for a new generation of poor pensioners by abolishing the second state pension." Jewish leaders said that the slur was the height of irresponsibility when there were growing fears over a rise of anti-Semitism in Britain, which has 280,000 Jews. Rabbi Dr Jonathan Romain, of Maidenhead Synagogue, a spokesman for Reform Synagogues, said: "I find the remark highly offensive. It is a throwback to the worst kind of stereotype from a bygone age. It is totally gratuitous to compare someone to a fictitious Jewish villain from 1837. Consciously or otherwise it is a reference to Mr Letwin's face rather than his politics." 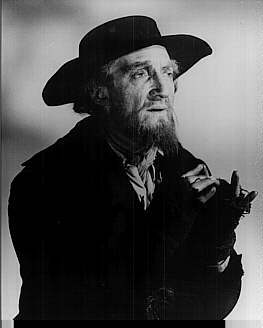 Perhaps the best-known image of Fagin is Ron Moody's portrayal (left) in the musical, Oliver, which won the 1968 best film Oscar. Moody, who is due to revive the role at the Marlowe Theatre in Canterbury next month, said he was outraged by the remarks and urged Mr McCartney to apologise. "I think it is disgraceful and irresponsible. Someone in Mr McCartney's position should choose his words more carefully. Fagin is a monstrous creation. He is a fence, a thief and a corrupter of children. "I do not think any Jewish person should be compared to him. Such a description is anti-Semitic." Lord Janner, the Labour peer and chairman of the Holocaust Education Trust, said he was "amazed" by Mr McCartney's comments. He said: "I know Ian is not an anti-Semite but comments like this do sound anti-Semitic. I know him very well and I like him very much. I am, however, astonished by the fact that he should make a comment like this." Mr Letwin's spokesman said: "It is sad that Labour have used this character in such a way and refuse to debate our policies in a more serious manner." Friends of the shadow chancellor said that he was proud of his ancestry and believed it to be insensitive of Labour to use such a stereotype against him. His parents, Shirley and Bill Letwin -- the name comes from "Latvian" -- were Jewish American intellectuals, whose parents fled persecution in Kiev. Mr McCartney said in a statement that it was "absolute nonsense" to say his scripted remarks were racist. 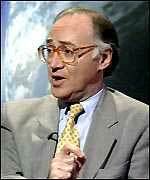 "I have spent all my life campaigning against racism and anti-Semitism. No one who reads the remarks in context could interpret them in that way. It is simply a reference to the Tory policy on scrapping the pension credit. This was a comment about Oliver Letwin's politics and the Tory Party's policies." Mr [Michael] Howard, (right) the son of a Romanian Jewish shopkeeper and the first Jewish leader of the Tories in 100 years, disclosed in his anti-racism speech in Burnley that his grandmother died in a Nazi death camp. He is a member of a liberal synagogue. 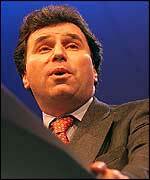 Until December , when he stood down to devote his time to being shadow chancellor, Mr Letwin was a director of NM Rothschild, the London branch of the Jewish banking dynasty. Lord Saatchi, the Tory chairman, is also Jewish. There have been fears over the re-emergence of anti-Semitism recently. An ICM poll in the Jewish Chronicle last month showed that one in five Britons would not elect a Jewish prime minister, one in seven thought that the Holocaust had been exaggerated, and one in five said that Jews had too much influence.